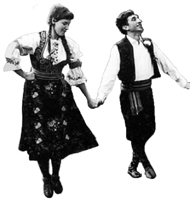 Information: Ciga and Ivon Despotović, teachers and producers of three CDs of Yugoslav dances. Miodrag "Ciga" Despotović, born in Belgrade (Beograd), Serbia on June 30, 1929, was a dancer and soloist of the world famous Yugoslav State Company KOLO for 18 years. With the company, he toured many countries, including Australia, China, Egypt, India, Israel, Japan, and the United States, as well as the countries of Eastern and Western Europe. He has choreographed for many Yugoslav dance ensembles. Ciga's wife, Ivon, was born in Amsterdam, the Netherlands. She studied at the Scapino Academy of Dancing and was granted a scholarship by the Dutch government to make a special study of folklore in Yugoslavia where she danced with the YugoslavState Company KOLO in Belgrade (Beograd) for two years. She was the only non-Yugoslav ever to be a member of this famous company. Following her stay in Yugoslavia, she did choreographic work for several Yugoslav and Dutch dance ensembles. Ciga and Ivon came to the Netherlands in 1966. Since then, they were active teaching Yugoslav folkdances, national dances from other countries, ballet, master classes for folk dance teachers, and doing choreography for professional and amateur groups. Their own dance ensemble, Joegoslavisč Danstheater ORO, consists of young Dutch amateur dancers, performs throughout the country. Ciga and Ivon toured through many countries in particular the Scandinavian countries and the United States to teach. During the summer and winter holidays, Ciga and Ivon organized study tours to Macedonia to familiarize participants with the authentic folk dance, music, and local culture of this part of Yugoslavia. One of the highlights of this tour is the Balkan Festival at Ohrid. Ciga died of cancer on May 17th, 2002, in Amsterdam. According to family friend, Ben Koopmanschap, "although his body was slowly deteriating, his mind was as sharp as ever and even until the very last minute he was concerned about folk dance and its future." Ciga produced four LP recordings utilizing contemporary Yugoslavian composers (each includes 16 Yugoslavian dances), as well as a "white" unofficial record and two CDs. The first CD, "Born of Love," with eighteen selections, was dedicated to their daughter, Dorinda (1968 – 1996). The second was "Born of Love 2," which had twenty selections. This approach, with the records and descriptions, was probably one of the reasons that the dances became so popular.